When fans of any sport talk about who was the best in their era and in their chosen sport, it's very subjective and all too often they don't even identify the criteria by which they've made their choice. Boxing is a terrific example. Muhammad Ali is arguably the greatest Heavyweight of all time but no one can realistically argue that he didn't meet his close match in the ring with Joe Frazier who was also great. Yes all the fights were after Ali's long enforced retirement but Joe did win a decision in the first of the 3 tremendous titanic battles. But he doesn't get the recognition of Ali. Why? Christiano Ronaldo is one of the greatest ever players but is he remembered as fondly by the older supporters of Man. United as George Best? Probably not and why is this? Pete Sampras was more successful than John McEnroe as a tennis player but regardless of personality, many fans remember McEnroe more fondly. Why is this? Well my theory is probably the reason I have chosen one particular player as the "best" player I have ever seen in a Wednesday shirt. As spectators we have this innate desire to be entertained in any sport by an artistry, flair, skill, imagination and touch that we in our wildest dreams couldn't imagine how to do or produce ourselves on our very best day at the height of our personal achievements. It what makes us pay our money. The long ball approach in football can sometimes succeed and result in goals being scored, but is it memorable? It may set the heart racing and encourage us to be partisan in our support but does it reach out to our desire for an elevated experience of artistry. Probably not, it is the people that give the appearance of playing the game in an unpredictable, apparently "naturally gifted, unrehearsed" manner that creates that heightened applause where the audience remain in awe of the sporting 'delivery'. Now I have seen some terrific strikers play for The Owls, who have got me out of my seat. David Hirst, Bronco Layne, Johnny Fantham to name 3 of many tremendous strikers. Des Walker, Peter Swan, Roland Nilsson were 3 of many players skilled in the art of defending. Tony Kay, John Sheridan, Carlton Palmer possessed wonderful if different qualities as midfield players as did many others who have played for us. We have had a plethora of fabulous and skilful wide players; Alan Finney, Derek Wilkinson, Willie Henderson, Terry Curran, Brian Marwood, Paulo Di Canio, and more recently Chris Brunt are just a few to remember. But for me, one wide man who epitomised grace and skill on the ball and who introduced that "romantic" element was the wing commander himself, Christopher Roland Waddle. Some players like Brunt, although young and learning, had great delivery and scored spectacular goals but they couldn't influence the game like the Waddler. Although he joined us towards the end of his glittering career, the mercurial Waddle was outstanding. He may have lost a fraction of pace by the time he came to Hillsborough but his vision, passing, crossing, control and influence on a game were undiminished and possibly even better. At the end of his first season with us he was deservedly voted the "Football Writers Player of the Year" and many of his performances really were different class. No other Wednesday player before or since has won that award which is a measure of how good he was! Whilst I believe David Hirst is probably under-rated by the wider football fraternity, I think the same applies to Chris, despite winning 62 England caps. He played in an era where the artistry of such players was too easily disregarded by coaches in favour of sheer strength and work rate. Players in the image of Chris Waddle were too often labelled as luxuries, an unnecessary embellishment! In France, where strategies were being implemented to produce a World Cup winning team, he was appreciated for the artiste he was; Marseille didn't want him working so hard that he'd be too exhausted to be creative when he had the ball. The genius of Waddle was clearly evident when he destroyed A.C. Milan in a European Cup semi-final. The media always focus on his penalty miss in the World Cup semi-final but in my opinion, Chris Waddle was brilliant that night and was probably Man of the Match. And many times for Wednesday he was consistently a game changer. There was the "Waddle game" against West Ham, the semi-final at Wembley against The Blades, and countless league games where his sheer brilliance dominated and illuminated the game. But unlike many superstars, he interacted well with the other players and the supporters. He was an entertainer but he was first and foremost a team player. 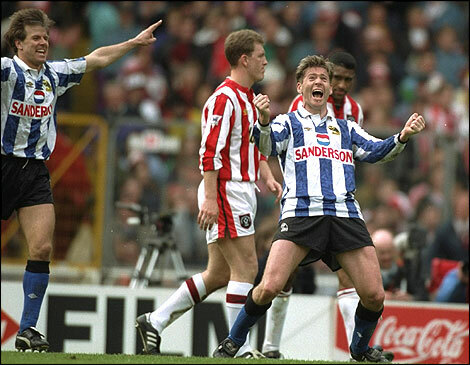 He didn't play for himself but the team was what was important to Chris Waddle, and he will long be revered and admired for this, making him a true legend at Sheffield 6. I feel privileged to have witnessed his genius and artistry in the famous blue and white striped shirts! It is exhilarating just to pay tribute to Chris Waddle. So altogether now, "Walking along, singing a song, walking in a Waddle Wonderland. There's only one Chrissie Waddle, one Chrissie Waddle, walking along, singing a song, walking in a Waddle Wonderland." Repeat ad infinitum! What a player, what a star, what a guy!